Purchasing a trash can probably doesn’t get as much thought as other kitchen or bathroom accessories. It is just viewed as a trash can that holds garbage, so why put much thought into which one you get, right? Well, finding the right trash can, whether it is for outside, your kitchen, or your office, can have more of an impact that you would think and takes a little more forethought that you might have thought. Two of the items on the previsous list had either low or no ratings on Amazon. They have been replaced with the Epica Stainless Steel Composter and the Rev-A-Shelf Pull-Out Waste Container. Both are highly recommended by experts and customers who purchased them. They have been placed in the top three. There are different sizes, styles, and features that different trash cans offer and knowing what your specific needs are will make the shopping experience that much easier. It is important to know the size and capacity of the trash can, so you know that it will fit in the desired location and so that it also has the desired capacity. It is also important to know what kind of features for which you are looking. For example, some trash cans come with no lids, some come with removable lids, some come with a foot pedals for a hands-free approach, and others take it a step further by having the trash can equipped with a motion sensor. Knowing what you are looking for before shopping can make your life that much more simple. 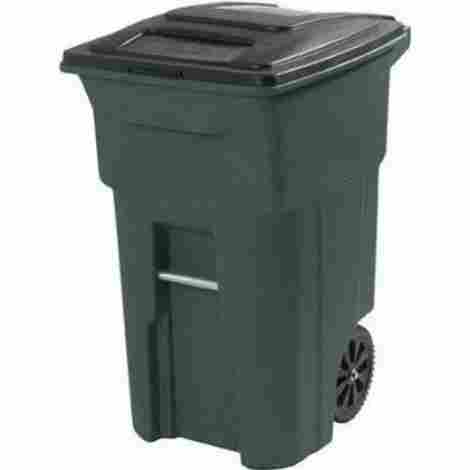 I have included a list of the best 10 trash cans that take all of these aspects into consideration. 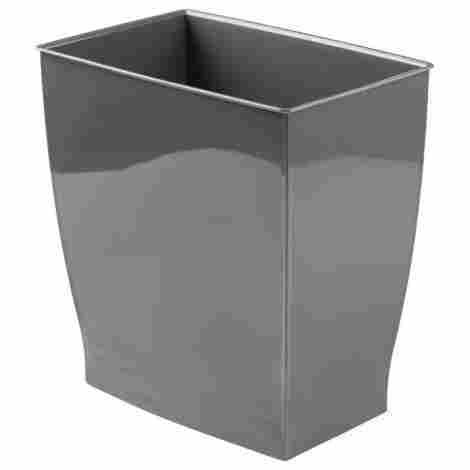 The Epica Stainless Steel Composter is primarily meant to be used for compost. It has an impressive stink-fighting feature that makes it a fantastic option as an odorless trash can. Convert the trash can into a mini-garbage receptacle. Highlights include the terrific charcoal filter performance in absorbing odors. The replaceable charcoal liner acts as a filter that absorbs odors and prevents odors from reaching outside air. Air holes prevent scraps from getting stinky and swampy. The performance level is maintained by replacing the filter regularly. The stainless steel design is attractive enough to sit on a countertop. It meshes well with other stainless steel kitchen appliances. The receptacle is easy to clean. The small and sturdy can fits in a dishwasher which makes cleanup simple. It does not leach chemicals or harbor bacteria the way plastic containers do. It can hold 1.3 gallons of waste. Several days garbage fits in the can. If used in the kitchen, it is meant for the stinkiest garbage. A traditional trash can is needed for odorless waste. The can will not chip, scratch, or rust. Familiarize yourself with changing the filter and determine the frequency for emptying the contents and you have made a wise choice. People who purchased the can declare it is unbreakable and the ideal size for composting. This is an easily affordable and highly recommended composting bin. It received 4.8 out of a five-star rating. That rating is impressive because there are 5774 reviews written. The Epica Stainless Steel Compost Bin is durable and looks really good. It is made in the U.S. The compost bin is a great gift idea. It is among the bestselling indoor compost bins on Amazon. The can is not air-tight. The Rolodex Mesh Round Wastebasket is the perfect trash can if you are looking for something that is small and convenient. Its small frame allows you to use this can in smaller areas that bigger cans won’t fit in. It is also made from a wires mesh that is very durable, so you won’t have to worry about it falling apart minutes after you get it! Tired of dealing with those plastic trash cans that crack and break? You won’t have that issue with this trash can because it is made from a strong wire mesh that is made to be durable, so you won’t have to worry about this can breaking. This trash can is the perfect size for those smaller areas that larger cans don’t fit in. The height of this can is 14 ¼” tall, the top measures at 11 ⅜”, and the bottom measures at 9 ¼”, which means that this will fit perfect in small areas, like bathrooms and offices. In comparison to other trash cans on this list, this one falls into the average price range for its size. 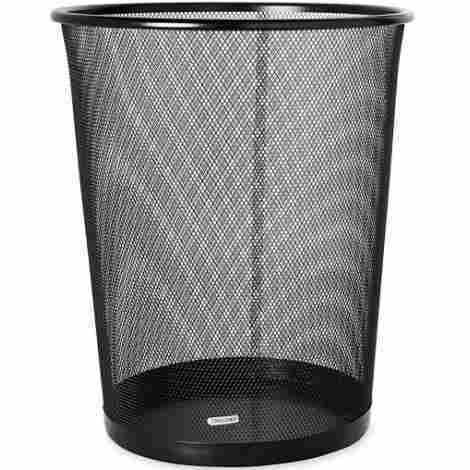 Given the fact that this trash can is made from a strong wire mesh, fits perfectly in tighter areas due to its smaller size, can hold up to 4.5 gallons, and can be purchased in bigger quantities, you are getting a great deal on a durable trash can. If you believe that sharp looking garbage cans still have no visible place in the kitchen, try the Rev-A-Shelf Pull-Out Waste Container. It is hidden from view. The container slides into and out of your cabinet. Manufacturers can try to beautify kitchen trash cans, but the fact remains they are trash cans. Everyone knows it contains trash. The Rev-A-Shelf model is an excellent idea for those who hate having a visible garbage can in the kitchen. The Main Feature of the Rev-A-Shelf is the smooth ball-bearing sliding system. It has heavy duty brushed aluminum slides that close softly and provide exceptional stability and support. The door mount frame is adjustable and eliminates side-to-side movement. There is a built-in area for storing bags. The waste container is black chrome. The system has a removable handle. A section inside your cabinet is dedicated to the small garbage can. The product is designed for 15-inch wide cabinets that have an 11½-inch opening. The frame is wireless. Clear instructions make installation straightforward. It attaches to roller bars that make sliding the can in and out easy. The can holds 35 quarts or approximately nine gallons of trash. The impressive, sturdy bracket system will support 100 pounds. The system is easy to install. Because waste is out of sight, it is not tempting to young children and pets. The wastebasket is of good quality. Customers tells us how easy it is to install and say it is worth the price. The Rev-A-Shelf is a space-saving improvement. The garbage pail is no longer a focal point. The mechanism fits over the lip of cabinets that have one. If you are in the market for a thinner trash can that can fit into the small, slightly awkward spaces in your home, then the Umbra Skinny Trash Can is the perfect fit for you. Made with convenience in mind, the narrow design makes this can the perfect fit for all of those narrow, awkward places that normal sized trash cans can’t fit into. This trash can is made from a durable polypropylene, which makes this trash can both durable and convenient. Coming in a variety of colors, this trash can is sure to impress you given its size. Durability is important when it comes to trash cans, no matter what size you are buying. This trash can is made from a super durable polypropylene, so you won’t have to worry about this trash can breaking or cracking. This trash can has a very unique, narrow design to it and it is because of this design that this trash can stands out in a crowd. The narrow design allows this can to fit into small, awkward spaces that other cans just can’t fit into. Don’t let the size of this can fool you though because it has the ability to hold 2 gallons and is also equipped with easy to grip handles. When you compare this trash can to other trash cans on this list, this one falls into the least expensive category for its size. Considering the unique, narrow design that allows this trash can to fit into small, tight spaces that other trash cans can’t, it is made from a very durable polypropylene that has the ability to hold 2 gallons, and comes in a variety of colors to choose from, you are getting an amazingly unique trash can for an incredible price that won’t break the bank! Looking for a heavy-duty outside trash can that can be hauled just about anywhere? Then the Toter Residential Heavy Duty Trash can is the perfect choice for you. Made from a thick, durable plastic, this trash can comes equipped with extra tough wheels that can handle most kinds of terrain, so you won’t have to worry about struggling with this can. It is also backed by a 10-year warranty, so you really can’t go wrong! This trash can is equipped with a unique rugged-wheel design. This design allows for easy transport on virtually any type of terrain, so you don’t have to worry about struggling to get this trash can across your yard. One thing you won’t have to worry about when it comes to this trash can is it cracking or breaking anytime soon! It was designed with extra rugged plastic and is equipped with a wear strip on the bottom of the can, so you don’t have to worry about the bottom of the can giving out due to weight. In comparison to other trash cans on this list, this one falls into the more expensive category for its size. Don’t let the price of this trash can steer you in a different direction though! Keep in mind that this trash can is made from a durable, thick plastic, has rugged wheels for easy hauling on virtually any terrain, is equipped with handles for easy lifting, and is backed by a 10-year warranty, so this is a deal that you can’t pass up! If you are looking for a small, compact trash can that offers a sleek design, then the InterDesign Mono Wastebasket Trash Can is the perfect one for you. 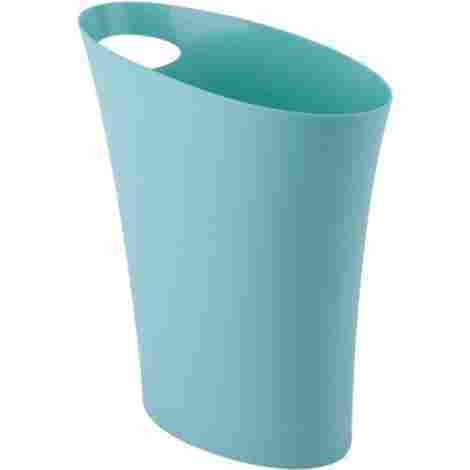 Made from a durable plastic, this trash can’s small size makes this a perfect fit for bathrooms, offices, dens, and more. Fitting in those smaller spaces, this trash can takes up minimal room and comes in a whole array of colors, so you are sure to find one that matches perfectly with your desired location. Have you ever heard of the phrase, “Good things come in small packages”? Well, this phrase holds true when it comes to this trash can. Measuring at only 11 ¼”X4 ½” X12”, this trash can will fit into those smaller rooms that just aren’t big enough for a larger trash can, making this a convenient and easily accessible trash can. We all have different taste when it comes to style and color. This trash can comes in a whole variety of colors, so you don’t have to worry about not finding a trash can that goes along with your sense of taste and style. If you compare this trash can with other trash cans on this list, this one falls into the more expensive category for its size. 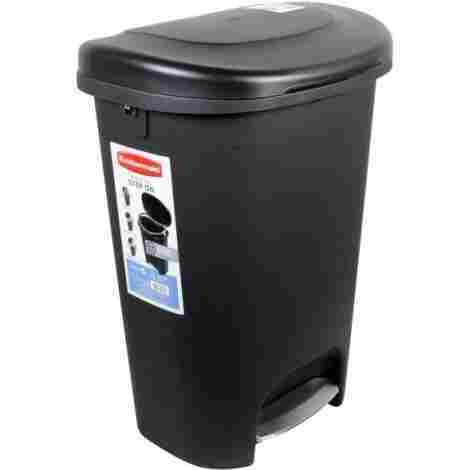 If you consider the overall quality plastic that this trash can is made from, the small size that allows this can to fit in smaller areas, the sleek design, and the variety of colors you can choose from, you are getting a good quality trash can for a decent price. The Simplehuman 13 Gallon Kitchen Step Trash Can is a great asset to any kitchen. Made from a tough, durable plastic, a steel pedal designed to last for years, and a slow, soft closing lid that makes minimal noise. This large capacity garbage can also come equipped with a bumper on the lid to protect your walls and comes with a 5-year warranty, so you can bet that this trash can was built to last. This top-notch garbage can was designed to last for years. It is equipped with a solid steel pedal that can withstand up to 150,000 steps in its lifetime, which equals out to be over 20 steps in one day over a timespan of 20 years, so you won’t have to ever worry about the pedal breaking or snapping. This trash can was also designed with a lid that closes so quiet that you won’t even hear it close. Its unique Shox technology closes the lid at a slow pace, so you won’t have to deal with that banging or smashing sound of the lid closing ever again. If you are looking for a trash can that was built with the ultimate durability in mind, then the Simplehuman 13 Gallon Kitchen Step Trash Can is the perfect choice for you. In comparison to other trash cans on this list, this one falls into the average price range according to its size. Considering that you are getting a solid plastic trash can that has a steel step that won’t break, a soft-closing lid, and is all backed by a 5-year warranty, so you are getting an amazing trash can for a great price that you can’t say no to! If you are looking for a trash can that it innovative and durable, then the BestOffice Automatic Trash Can is a great choice for you. Made from a sturdy stainless steel, this trash can has a built-in sensor that opens the lid when you are next to it. This 13-gallon trash can also comes equipped with a removable rim that conveniently holds your garbage bags firmly in place. This trash can was designed with efficiency in mind. Equipped with a built-in sensor that detects motion, this can does most of the work for you. This battery powered sensor picks up on motion as you are standing next to it and slowly lifts the lid, so you don’t have to use your hands. If you are looking for durability, then this is the can for you. Made from a stainless steel, this 13-gallon trash can was made to withstand normal wear and tear, so you won’t have to worry about that unnecessary cracking or bending. When you compare this trash can to other trash cans on this list, this one falls into the average price range for its size. 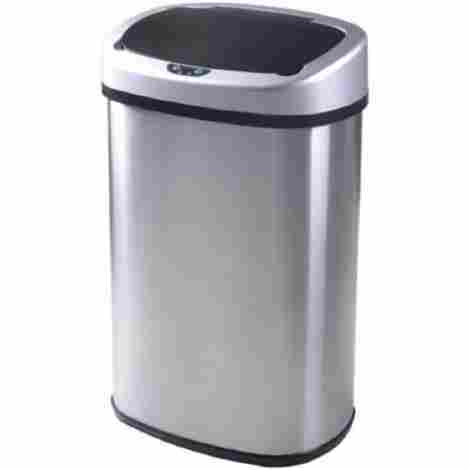 Given the fact that this trash can is made from a strong stainless steel, is equipped with a motion sensor that opens the lid for you, and has a removable rim that helps lock the trash bag in place, you are getting an amazing trash can for a great deal. Made from a durable plastic, the Rubbermaid Step-On Wastebasket is one trash can that was built to last. This trash can was also designed with a steel pedal for hands-free access and a unique lid design that stays open, even when your foot is not on the pedal. Available in two colors and a variety of styles, this trash can will surely leave an impact. This trash can has an innovative, unique lid design that sets this apart from the rest. The lid has the ability to stay open, even when you are not pushing on the pedal. This means that if you have to make multiple trips to the trash can, you don’t have to keep pushing on the pedal to open the lid. How many times have you gone to throw garbage away in the trash can, just to have the liner slip off of the sides? It can be so frustrating and annoying because nobody wants to stick their hands in the garbage to pull the liner up. That won’t be an issue with this trash can because it is equipped with a locking system that locks the liner in place, keeping your trash can and your hands clean and garbage-free! In comparison to other trash cans on this list, this one falls into the less expensive category for its size. Given the fact that this trash can is made from a durable plastic, is equipped with a steel pedal, has a unique lid design that stays open, even when your foot is not pressing the pedal, has a locking liner feature, and is available in two colors and a variety of styles, this is one deal that you don’t want to pass up! 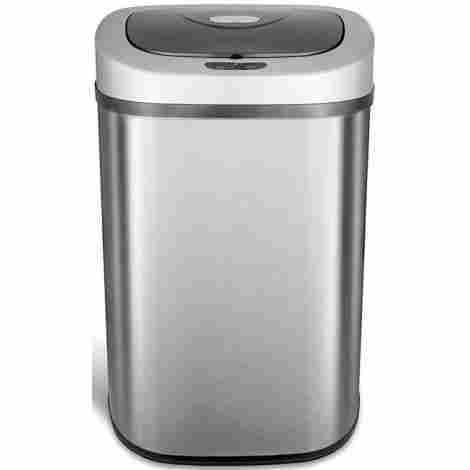 If you are looking for a new, innovative trash can that is touchless and has a motion sensor, then the Ninestars DZT-80-4 Automatic Touchless Oval Trash Can is the perfect choice for you. Designed with efficiency and effectiveness in mind, this trash can takes all of the worries about germs right out of the picture. The trash can is equipped with a motion sensor that opens the lid as soon as it detects motion. The base is designed to be skid-free and the lid has a soft open and close feature, so you won’t have to deal with the slamming of the lid. Backed by a 2-year warranty, this trash can sure is one-of-a-kind. Have issues with touching the lid of the trash can? That won’t be an issue with this can because it was designed to be touchless. It is equipped with a motion sensor that is water resistant and opens when it senses motion, which means that you can stand mere inches away from it and the lid will automatically open. This allows for a hands-free and germ-free approach, which I think most people would be ecstatic about. This trash can was also designed with capacity in mind. Holding 21 gallons, which means fewer garbage bags, this trash can is one step above the average trash can. It was also designed with an extra wide opening, so throwing trash away will be clean and easy. If technology is what you are looking for, then look no further because this trash can has everything that you need. When compared to other trash cans on this list, this one falls into the more expensive price range. Considering the motion sensor technology that is water resistant and can detect motion mere inches away, the larger 21-gallon capacity, the skid-free base, and the soft-closing lid all backed by a 2-year warranty, you are getting a highly innovative trash can that is worth every penny spent. After looking at this list, you can see how many different types and styles of trash cans there are and how important it is to know precisely, what you are looking for. 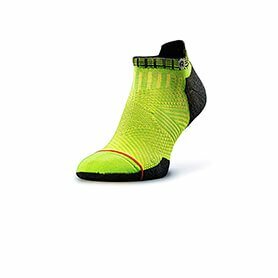 Aspects like, the size of the trash can you need, can have a significant impact on your options and end up costing you time and money if you get the wrong size. You also want to make sure that you are getting a trash can that best suits your needs. If you are planning on using it to do some major hauling of garbage, then you should probably find a trash can that is extra durable, so you won’t have to worry about the bottom falling out. There are a lot of things to factor in before you make that purchase and this list was derived from helping you narrow down your choices and help you succeed at finding that perfect trash can! The size of the trash can you will need is one of the most important aspects to keep in mind. You don’t want to end up with the wrong size and then have to go through the whole process all over again. If you plan on getting an outdoor trash can, you will want to make sure that it holds the capacity that you are looking for and fits in the area that you have planned. Luckily, you generally have more options as to where you want to put your outside can and a bigger area from which to work. Looking for an inside trash can may be a little trickier when it comes to the size. Most of us have limited space when it comes to extra things like trash cans, or we happen to have a preference as to where we want it located. Since space can be limited, the best option is to take measurements of the area of the designated location, so you can find the right one that fits that space. You will also want to make sure that you are getting the capacity you need as well. The material that the trash can is made from is also another critical aspect to keep in mind, especially if you plan on using it for any major hauling. Most trash cans are made from either mesh, plastic or a galvanized steel. Galvanized steel trash cans tend to be the most durable due to how tough steel is, although they do tend to be a bit more on the expensive side. Plastic trash cans can be pretty durable as well. It just depends on the overall thickness of the plastic. Mesh trash cans are less durable than galvanized steel or plastic and may tend to bend easily if handled too rough or when heavier objects are put in them, but they do work perfectly for smaller bathroom garbages or for the office. 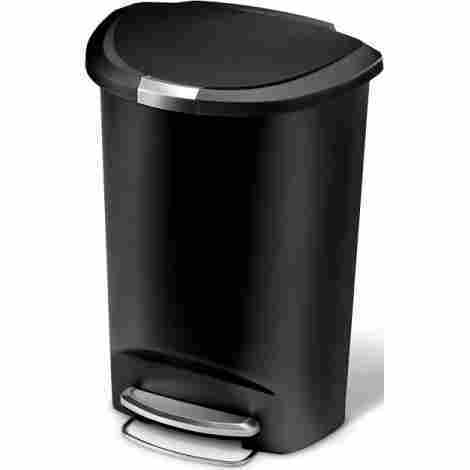 The overall function of the trash can plays an important role in which trash can you choose as well. Trash cans these days are so much more than just a can with a bag. They come with so many different features, so it is important to know what you are looking for. If you are looking for a regular trash can for your kitchen and aren’t looking for anything fancy, then just a can with a bag is all you need. If you are looking a little more advanced, then you might want to consider getting yourself a trash can that is equipped with a step pedal. A step pedal allows you to open the lid of the trash can with ease and germ-free ease of mind. This technology allows you to open the lid without having to put your hands on it, which is great if your hands are full or are just grossed out by having to touch the germ-infested lid. If you want to take it even a step further from the step pedal, then your next option is getting a trash can with a motion sensor on it. The motion sensor is designed to pick up on movement in front of the can and open the lid automatically, so not only do you not have to worry about touching the lid, but you don’t even have to worry about touching the can at all. Once the motion sensor no longer senses motion, the lid will close by itself. The cost of the product is always an important aspect to keep in mind. Being mindful is no different when purchasing a trash can. You will want to make sure that you are getting what you need at a price that you can afford. When it comes to the cost of trash cans, there are a few factors that play into the overall cost. One of the factors is the size of the trash can. You are going to be spending more money on a larger trash can than you will on a smaller trash can because it takes more material to make the larger ones. The material it is made from is also another factor that plays into the overall cost. The type of material used and the overall quality of it will determine how much money you will have to spend. Mesh trash cans tend to be the cheapest, while heavy-duty plastic trash cans and galvanized steel cans tend to be a bit more expensive. Keep in mind that you are paying for the overall quality and durability of the trash can, so sometimes it is worth it to spend a few extra dollars if it means that it will last longer. One of the factors that can impact the cost the most has to do with the features that trash can offers. The more high-tech the features, the more likely the price will go up as well. For example, a trash can with just a lid will most likely be less expensive than a trash can with a step pedal, and a trash can with a step pedal will most likely be less costly than a trash can that is equipped with a motion sensor. How much money you want to spend may depend a lot on the type of features that you are looking for. You can also expect the outdoor trash cans to be a little more on the expensive side because they are quite a bit larger and are made to be a bit more durable than the indoor trash cans. Q: Do all trash can lids have a locking mechanism? A: No, not all trash cans come with a lid that locks shut. Some trash cans come with a lid that can be opened by using a step pedal, some have motion sensors that open the lid, some outdoor trash cans have handles that lock the lid in place, and some trash can lids just sit on top of the garbage can without any type of locking system. If you are looking for a lid that locks in place, then you will want to make sure that you read the product details prior to purchasing your trash can. Q: Are all outdoor trash cans set up for automatic garbage disposal? A: If you live in an area where you use automatic garbage removal, then it is important to look for a can that has that capability. Not all trash cans are created equal and not all of them are equipped for automatic garbage removal, so it is always important to read up on the features in the product details. Q: Are all motion sensor trash cans battery operated? A: Most motion sensor trash cans are battery operated, which would require you to have to replace the batteries every few months depending on how often you use the trash can. There are some brands out there that have a plug-in feature, so if that is what you are after, then make sure you pay attention to what the product details say about that specific trash can.